Pictured (L-R)-Front row: Warner Chappell’s Ben Vaughn, Combustion’s Chris Farren, Ashley Gorley, and Chris Van Belkom. 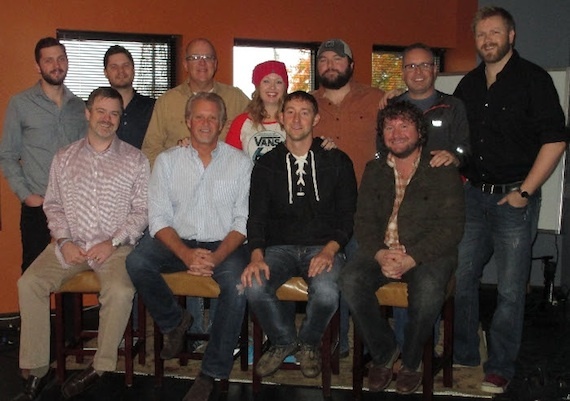 Back row: Combustion’s Kenley Flynn, Warner Chappell’s Matt Michiels, Phil May, Alicia Pruitt, Blain Rhodes, Steve Markland and BJ Hill. Chris Farren, Falcon and Kenley Flynn announced that Ashley Gorley has renewed an exclusive songwriting deal with Combustion Music and partner Warner/Chappell. Gorley has been with Combustion since 2001, and has earned 13 chart-topping songs. Gorley currently has three singles on Country radio, with more slated for 2014. Gorley’s songs have been recorded by Kenny Chesney, Luke Bryan, Florida Georgia Line, Darius Rucker, Rascal Flatts, Joe Nichols, Chris Young, Scotty McCreery, Jake Owen, Brett Eldredge, Billy Currington, and Thomas Rhett.